iHeartMedia and AT&T have announced the ultimate celebration of summer with the iHeartSummer ’17 Weekend by AT&T at the legendary Fontainebleau Miami Beach on Friday, June 9th and Saturday, June 10th. The weekend-long event will feature live performances from DJ Khaled, Halsey, Miley Cyrus, Backstreet Boys, Fifth Harmony and Noah Cyrus, with more special guests to be announced. In addition to performances from the year’s top artists, the jam-packed weekend will celebrate all things summer with a variety of beach games, events and activities including the All-Star celebrity beach volleyball tournament featuring some of today’s hottest artists, athletes, DJs and more. The event will continue to heat up throughout the weekend with an all-day pool party on Saturday featuring sets by iHeartRadio’s house DJs, including DJ Prostyle, DJ Obscene and DJ Whutever. Beginning Monday, May 15th through Friday, June 2nd, iHeartMedia and AT&T are launching a national on-air and online promotion across its mainstream and rhythmic Contemporary Hit Radio and HOT-AC stations giving hundreds of listeners a chance to win iHeartSummer ‘17 Weekend by AT&T packages. Winners get to enjoy summer their way with round-trip airfare, two-night luxury hotel accommodations at Fontainebleau Miami Beach for two and access to events throughout the weekend. AT&T will present one Grand Prize Winner with an all-access fantasy weekend that includes a VIP experience with an artist and taking home an All New 2017 Jeep Compass. 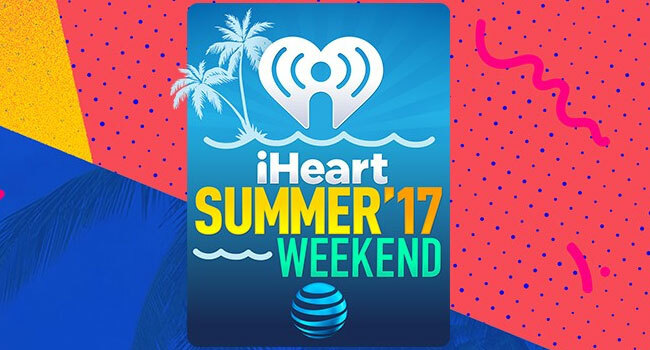 Fans can listen to a special iHeartSummer ‘17 Weekend by AT&T live broadcast Saturday at 8 pm ET/PT on iHeartMedia Mainstream Contemporary Hit Radio (CHR), Rhythmic Contemporary Hit Radio (RCHR) and HOT-AC stations nationwide. AUDIENCE Network from AT&T will broadcast the weekend celebration as a two-day television special on June 23rd and June 24th at 8 pm EST/PST via DIRECTV Channel 239 or U-verse Channel 1114, giving music fans across the country the opportunity to experience the highly anticipated event. Packages start at $499 per night and include two passes to the event and breakfast for two each morning at Vida. Stay an extra day and enjoy Sunday night for an additional $199 which also includes breakfast for two. Tickets available at fountainblue.com/iheart. iHeartSummer ‘17 Weekend by AT&T at Fontainebleau Miami Beach is part of iHeartMedia’s incredibly successful roster of major concert events, which includes the iHeartRadio Music Festival, the iHeartRadio Fiesta Latina, the nationwide iHeartRadio Jingle Ball Concert Tour, the iHeart80s Party, the iHeartCountry Festival and the iHeartRadio Music Awards, which generated 165 billion social media impressions.